Here's an easy introduction to U.S. history for your child! 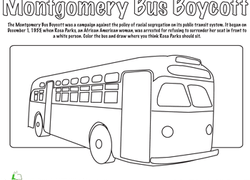 This coloring page features educator and civil rights leader Mary McLeod Bethune. Here's Marie Curie, a famous scientist, at home in her lab where she made some of the most important scientific discoveries of the 20th century. 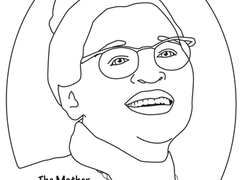 If your daughter is an animal lover, give her this inspiring coloring page of one of the most famous scientists of the 20th century! A coloring sheet for 1st graders about people from around the world. This one is of a Peruvian girl in traditional clothes. A coloring sheet for 1st graders about traditional clothing from around the world. This one is of a Chinese girl in traditional dress. A coloring sheet for 1st graders about people from around the world. This one is of a Japanese girl in traditional clothes. Learn more about Sally Ride's amazing career in aeronautics by coloring in this cartoonized version of her! Identify National Doctors' Day on a calendar, then create a picture to share with a doctor you know. Florence Nightingale revolutionized nursing and remains a beacon of proper healthcare to this day. Don't let her proper posture and folded hands fool you -- Susan B. Anthony has a long history of speaking her mind! Eleanor changed the definition of the First Lady -- she used her status and wealth to help change the lives of those less fortunate. Meet Clara Barton, a famous nurse and humanitarian, by coloring in this portrait of her. Identify National Teacher Appreciation Day on a calendar, then create a picture to share with a teacher you know. Identify National Law Enforcement Day on a calendar, then create a picture to share with an officer you know. Identify International Firefighters’ Day on a calendar, then create a picture to share with a firefighter you know. Identify School Lunch Hero Day on a calendar, then create a picture to share with a lunch hero you know. Kids color and cut out a native costume for this paper doll, then guess what country the doll is from. Hint: The capital city is Lima.